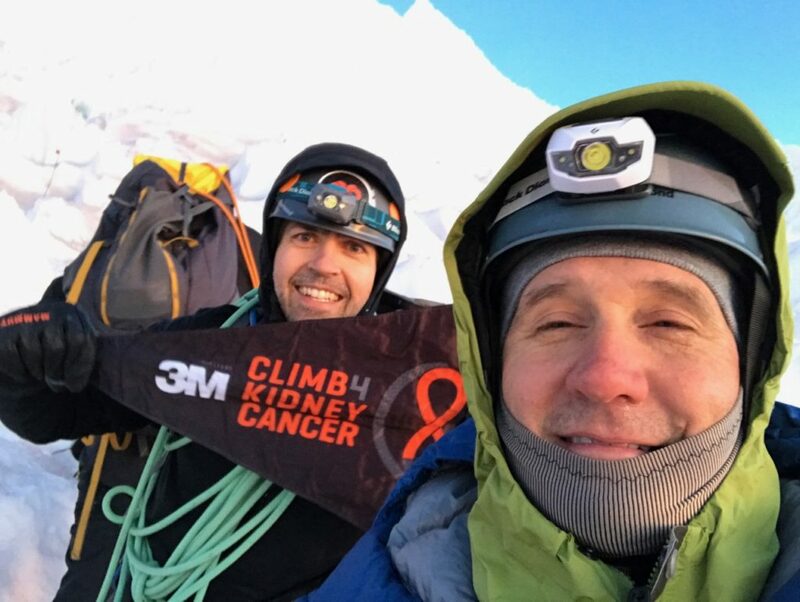 Check out the patient’s stories who inspired us! 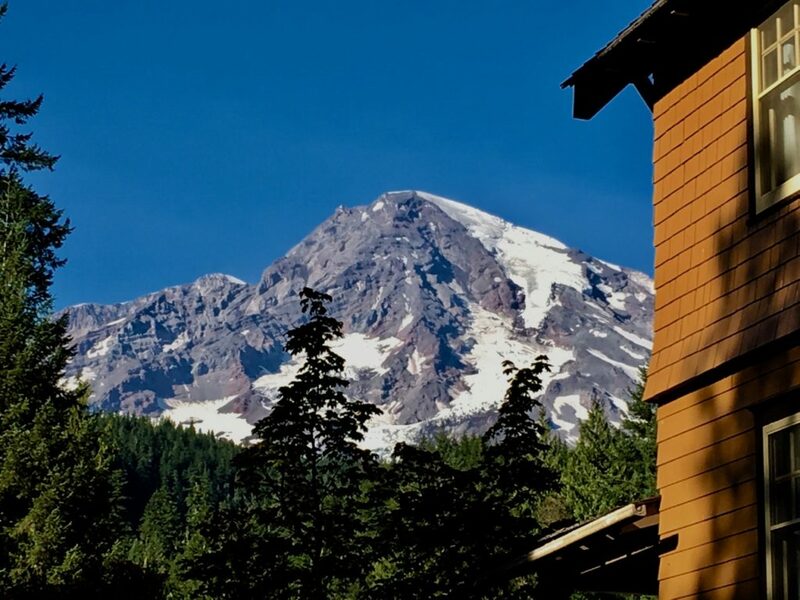 We arrived to Paradise and were blown away by the majesty of the tallest volcano in the continental United States. 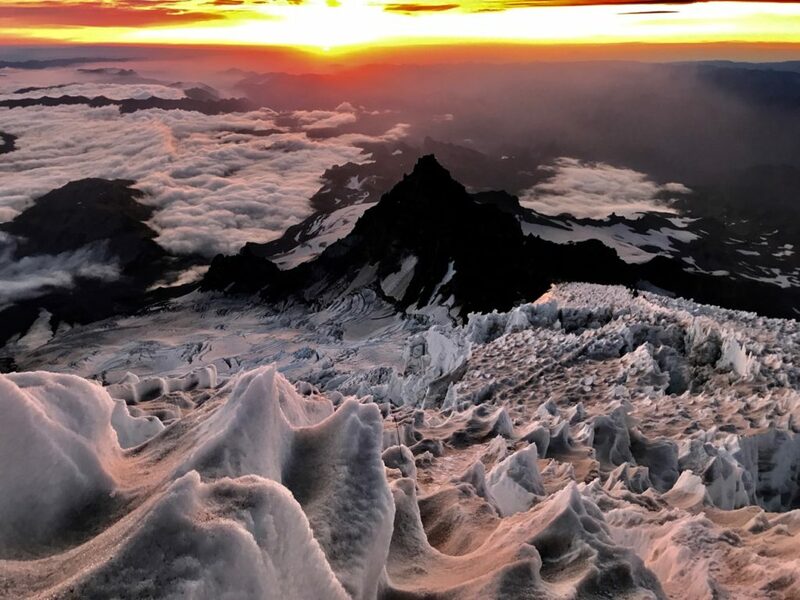 Mount Rainier is the most glaciated mountain outside of Alaska because average snowfall has typically outpaced average melting. 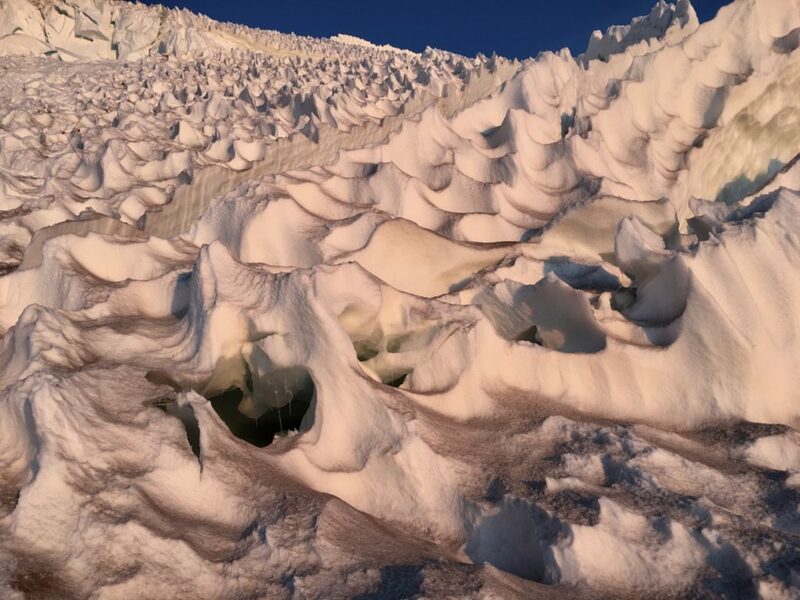 That means that snow accumulates and compresses into ice and becomes a glacier. 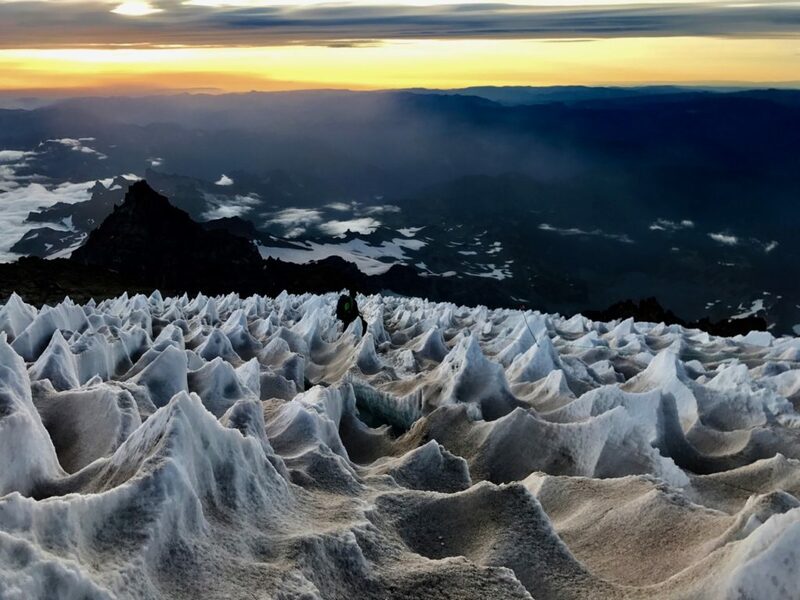 This year however, due to record high temperatures in the Northwest US, the glacier has melted more than it normally does. 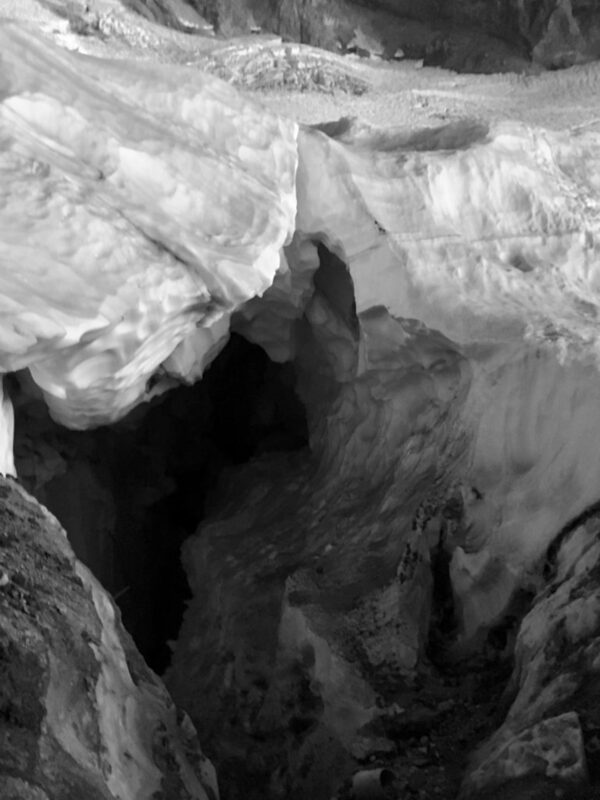 This causes the glacier to crack and break away, making climbing much more hazardous. 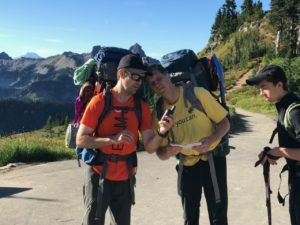 When we checked in for our climb we were given three foreboding bits of information, 1) that very morning the climbing rangers got a 911 call because a climbing group was stranded on the mountain. 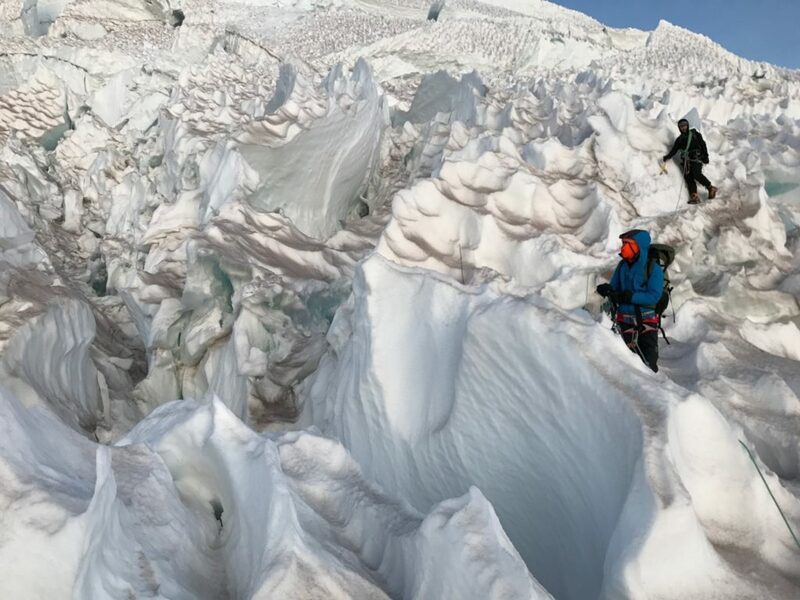 They made it successfully to the summit, but part of the glacier shifted and collapsed and the ice that held them on the way up had broken and they couldn’t get back down. 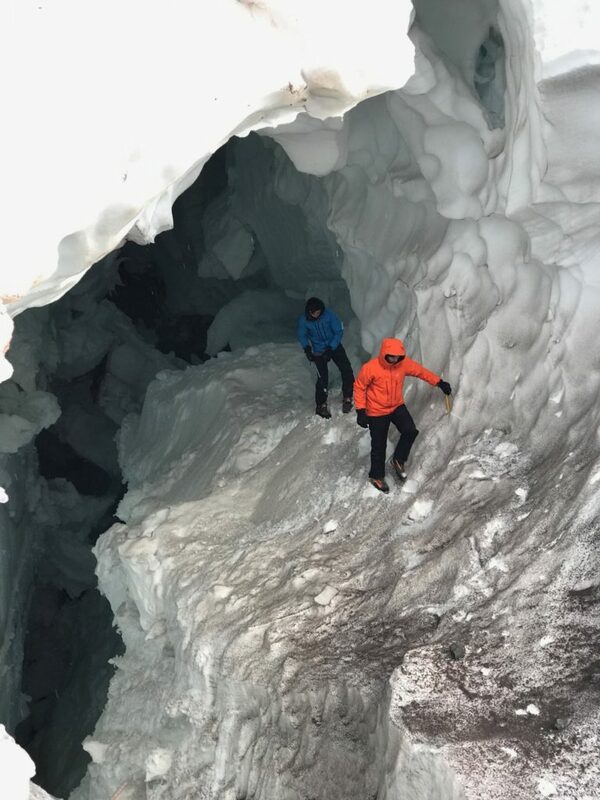 Fortunately they eventually were able to safely get down, 2) the climbing rangers last day of work for the season was the day before we were to start up the volcano, 3) the rescue helicopter also finishes on the same day meaning any sort of rescue would be very delayed. 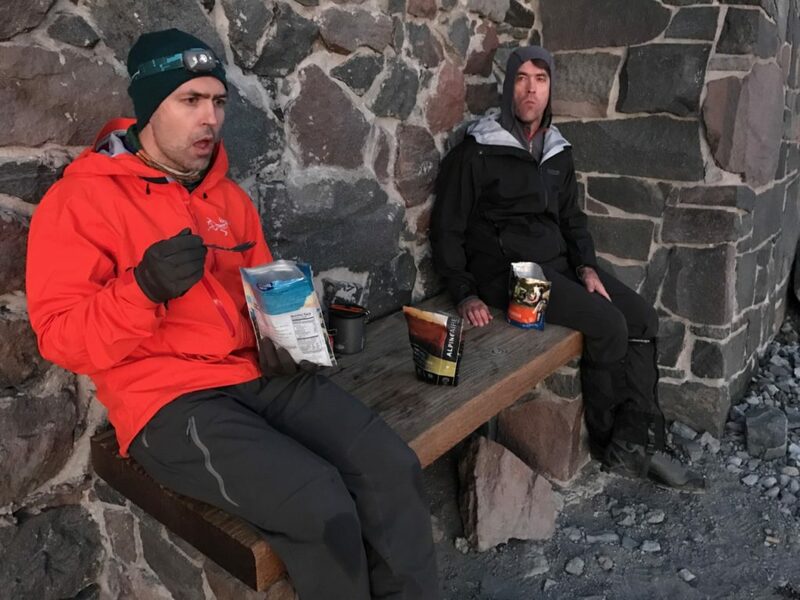 But the forecast called for cooler temperatures and we were hopeful that this would help solidly the route, literally freezing things into place. 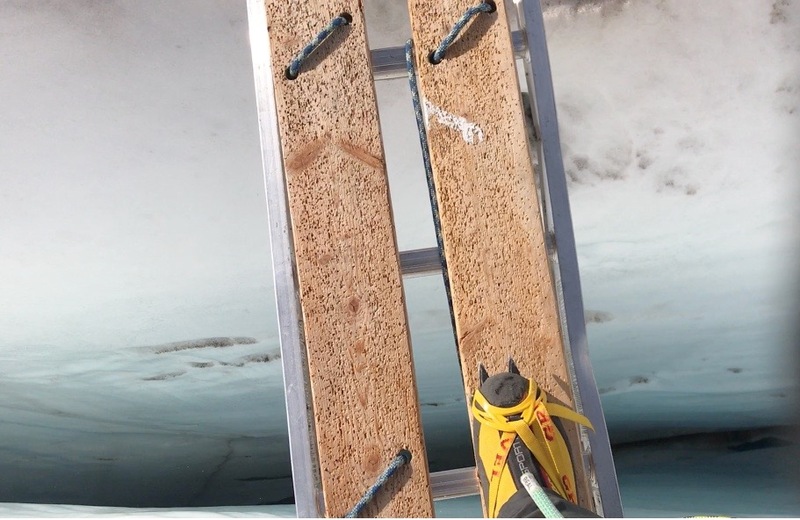 This sort of climb requires lots of gear that must be carried on our backs! 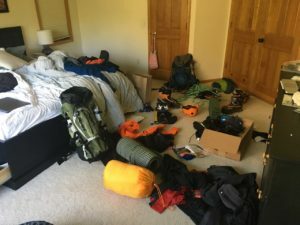 Once loaded up, our packs were between 35-55 pounds! 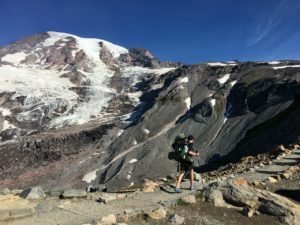 We check our gear, hefted on our packs, some of which were nearly 30% of our body weight and headed up on a bright, warm spring day. 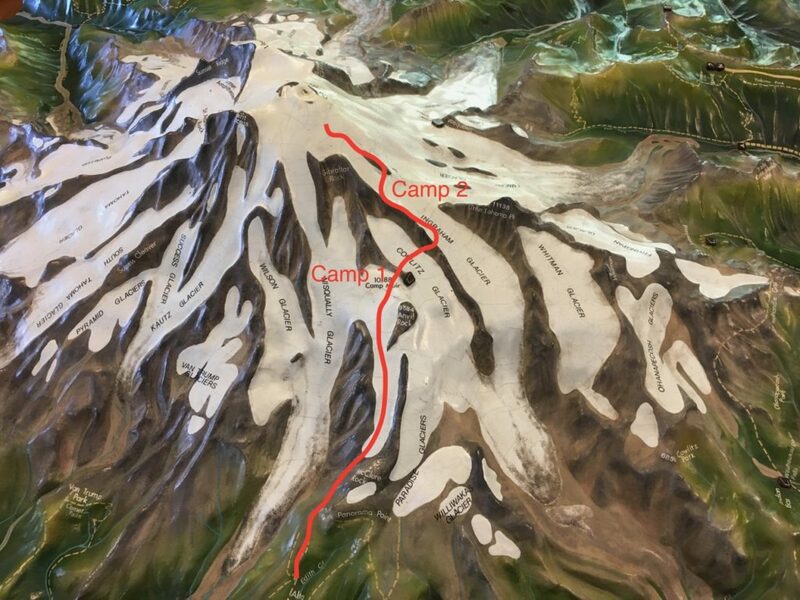 Our goal for the first day was Camp Muir about 5000 feet up. 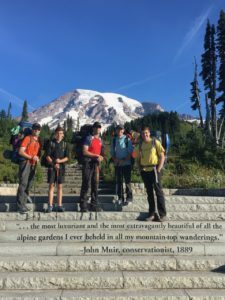 The trail begins through a beautiful alpine meadow and soon the massive scale of this mountain and its glaciers could be produced as we made our way along the Skyline trail towards Pebble Creek. Given the fact that most of us live at or close to sea level, we knew we had to ascend slowly to try to acclimatize to the altitude. 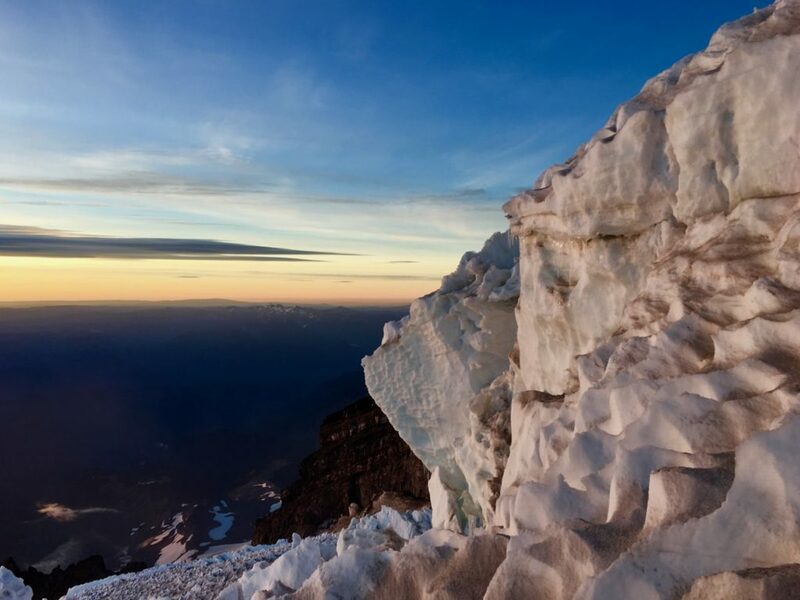 Camp muir has several buildings including outhouses that are helicoptered in and out each season, a NPS building, some buildings for professional guiding companies and a public shelter, which we chose to sleep in. 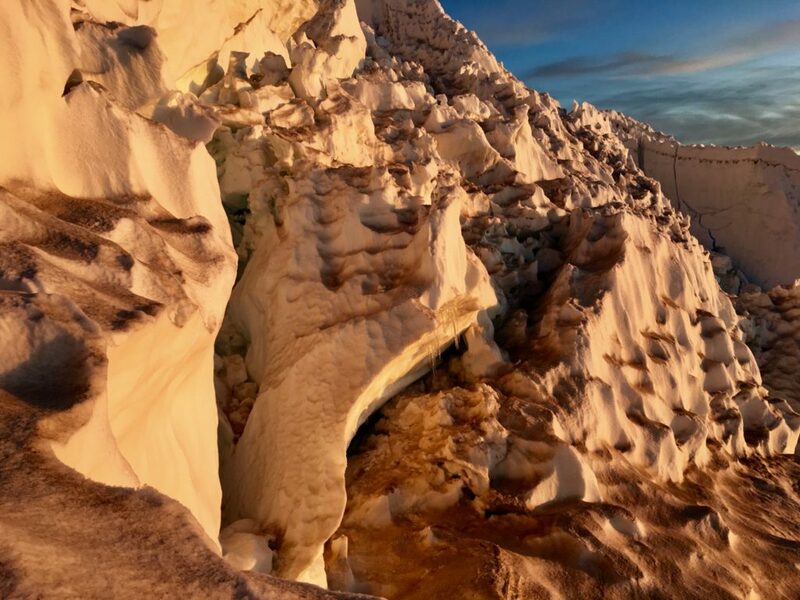 There is no water at camp muir, but there is lots of snow. So we had to melt down the snow/ice for water. 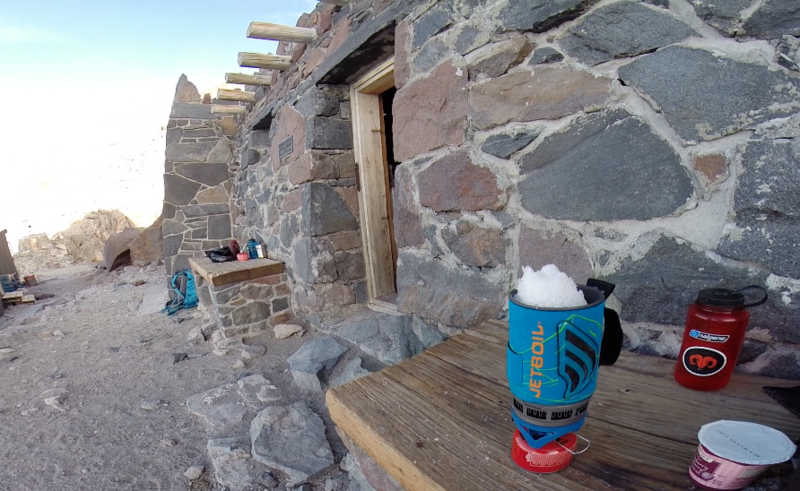 Using the JetBoil stove to melt the ice for water and to cook dinner. 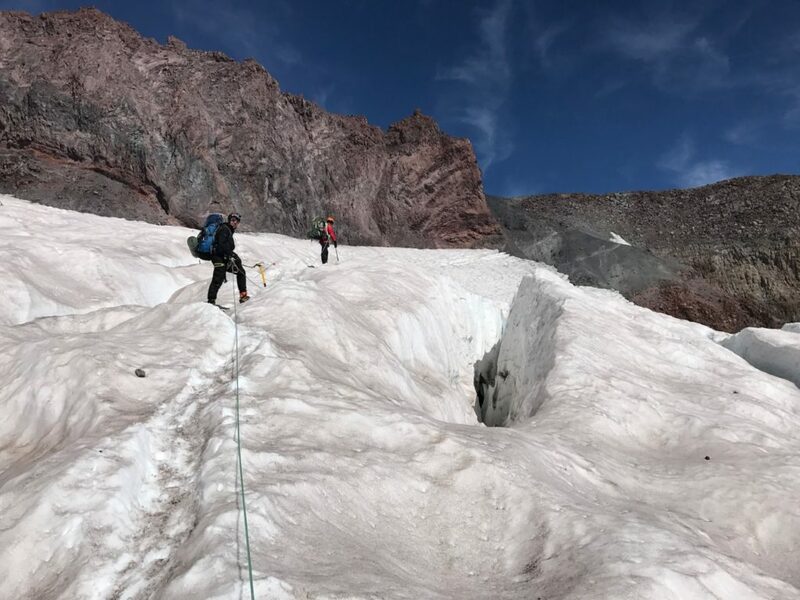 For day 2 we planned to cross the Cowlitz Glacier, climb through the Cathedral Rocks and camp on the Ingrahm Glacier in the flats. 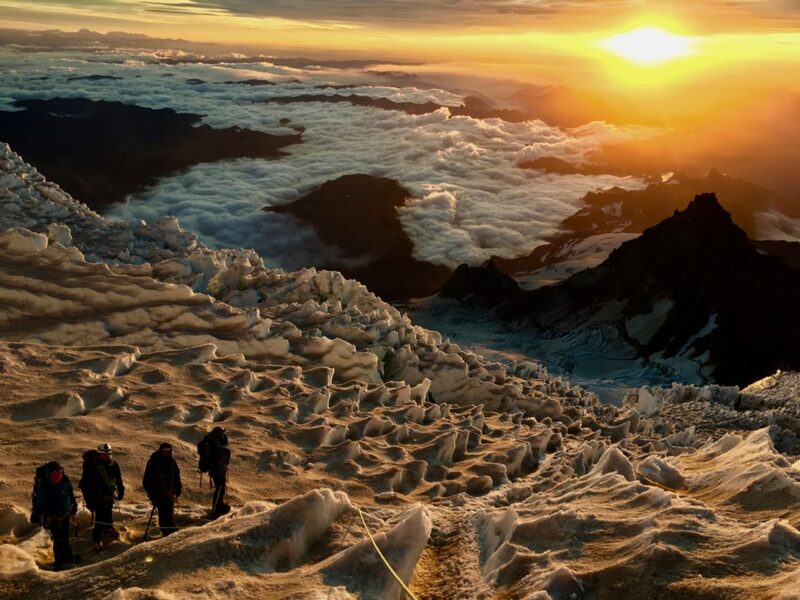 We rose early to watch the sunrise and explore a tremendous crevasse over which we had unknowingly walked the day before. 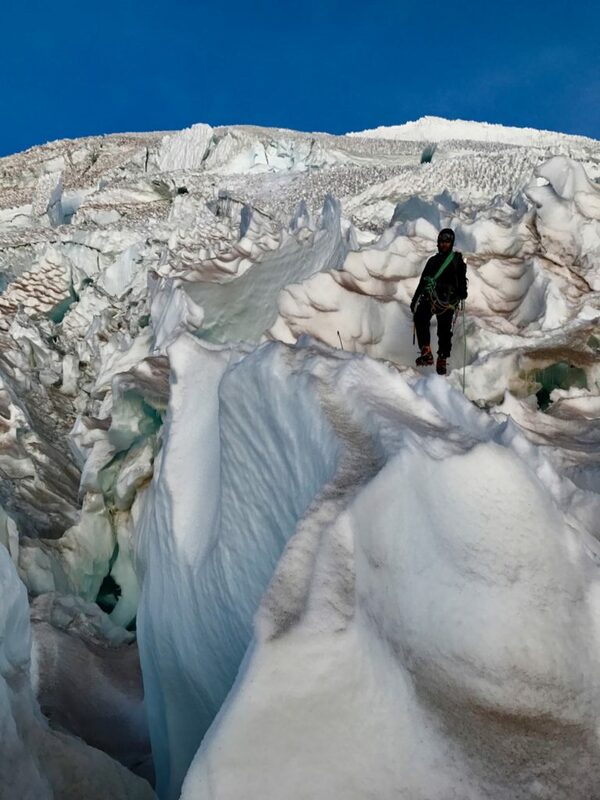 After climbing through the Cathedral Rocks, we arrived at the Ingrahm Glacier. 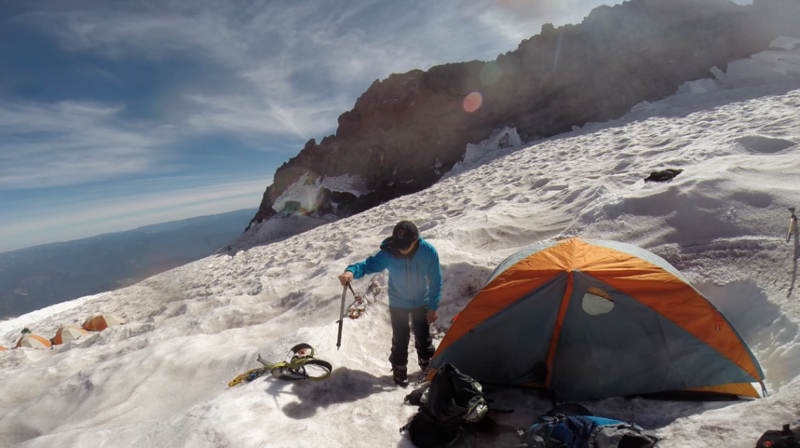 We pitched our tents just to the left of the jaw dropping opening in the glacier. Sleep walking here could be fatal. 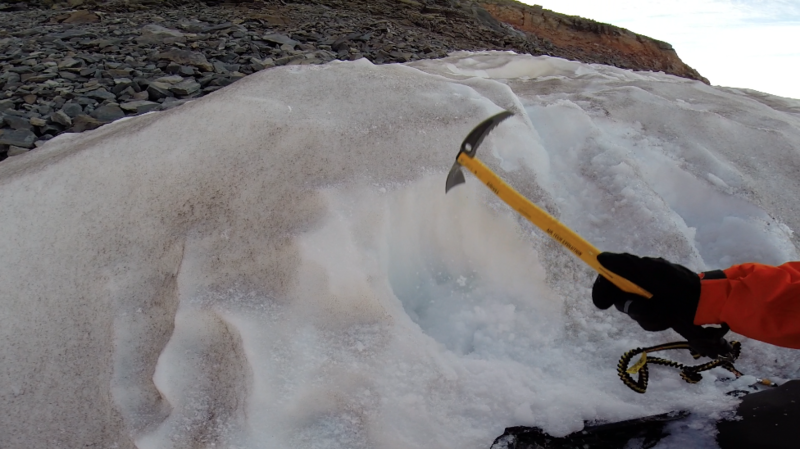 We dug out and flattened a sun cup on the Ingrahm Glacier and pitched our tent. The weather forecast was for high winds and cold weather. 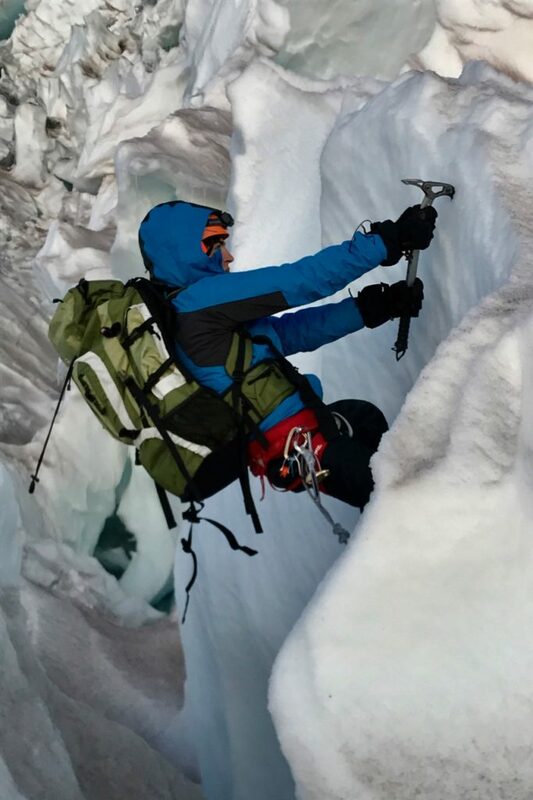 We were happy about the cold to solidify the route, but high winds make the climb much more dangerous by zapping energy and heat, but destabilizing our footing on steep icy slopes. We suffered all night with high winds battering our tent all night long and sleep was impossible. 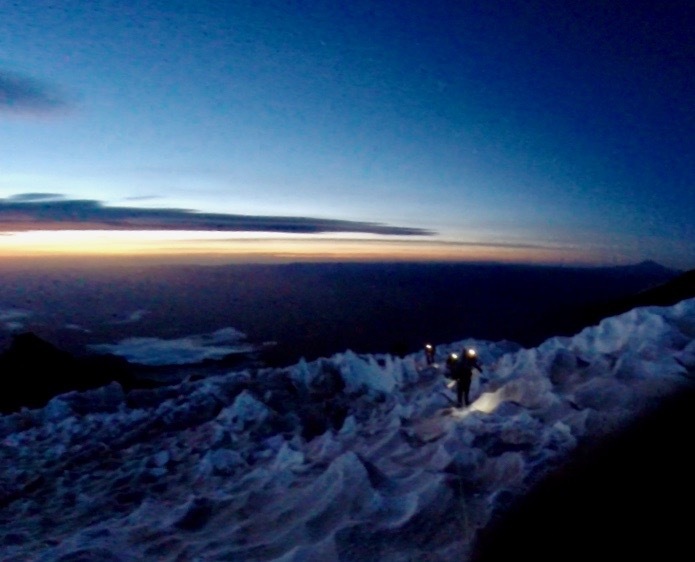 We got up, roped up and headed up the mountian around 245 am. 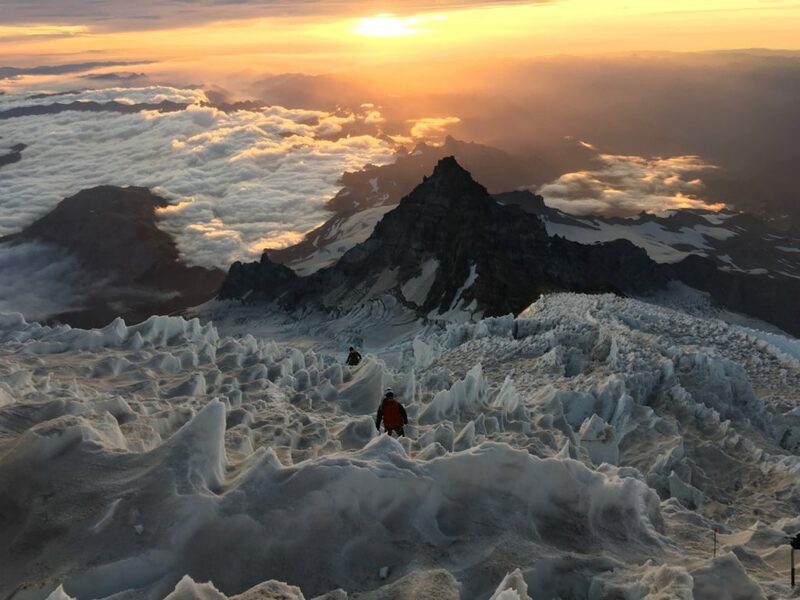 After climbing for several hours in the dark over the Ingrahm Glacier and the disappointment cleaver, the first bit of sunlight raced over the horizon. 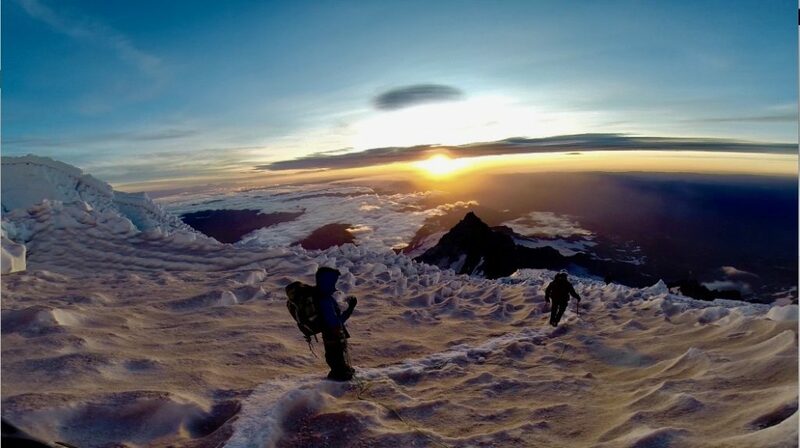 At about 12,600 we witnessed an unbelievably beautiful sunrise. 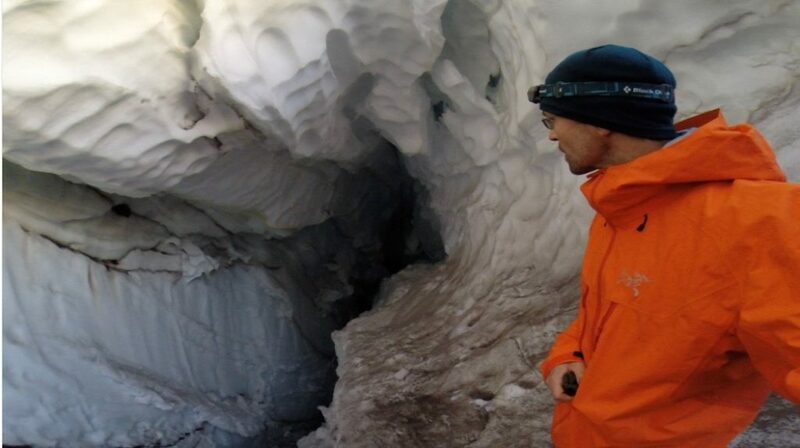 At this point, we became much more aware of the tenuous nature of the terrain we were on. There were 3 other guided climbing groups just ahead of us. They all decided to turn back because the conditions were not safe. We gathered together and conferenced on whether we should continue. 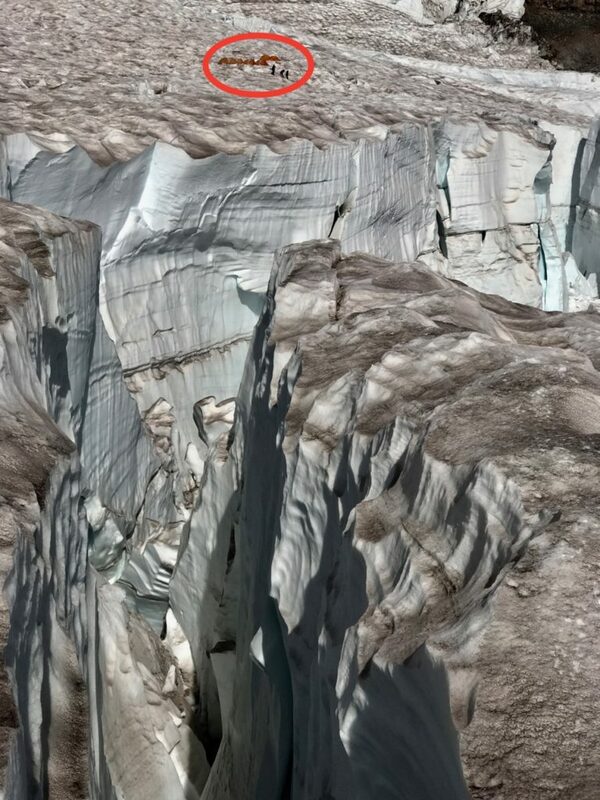 We were now only a few feet away from where the glacier had collapsed a few days before. 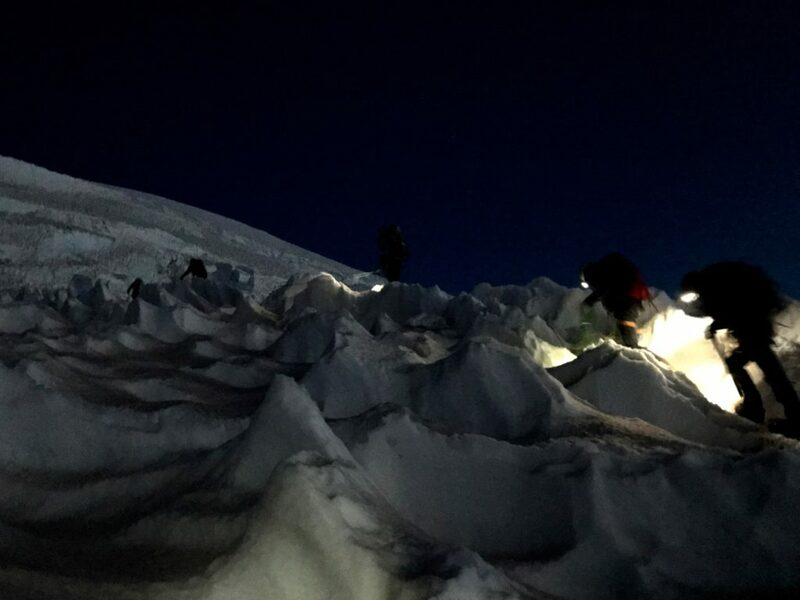 We were all feeling fine physically, but knowing the conditions weren’t good and that any sort of rescue would be extremely delayed or impossible, we elected to progress no further. 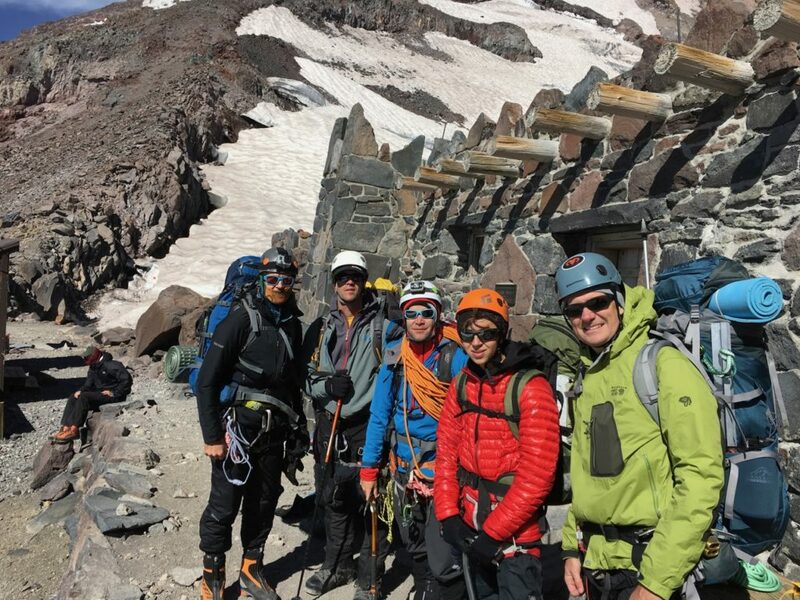 A successful climb is when the entire team comes home safely, the summit is an optional part. 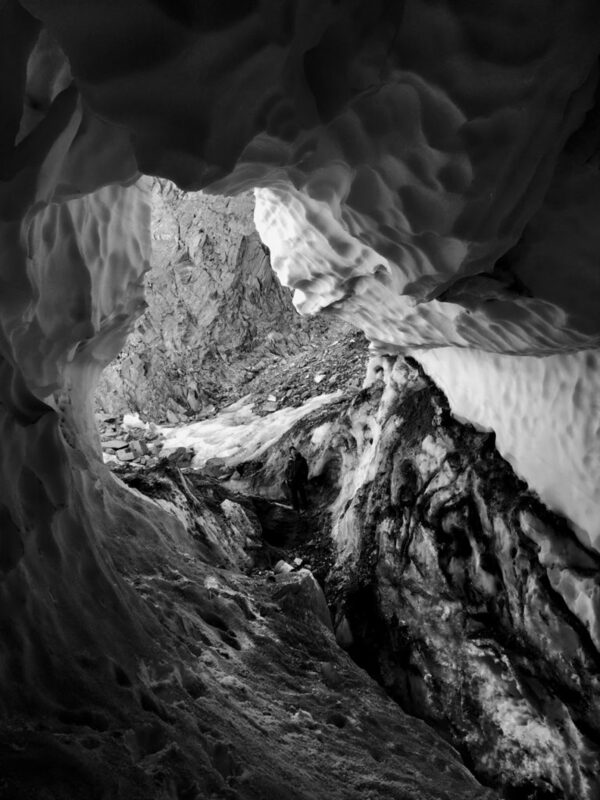 As we looked around, we felt as if we were in another world, surrounded by nieves penitentes. We were so close as you can see outlined on the model below. 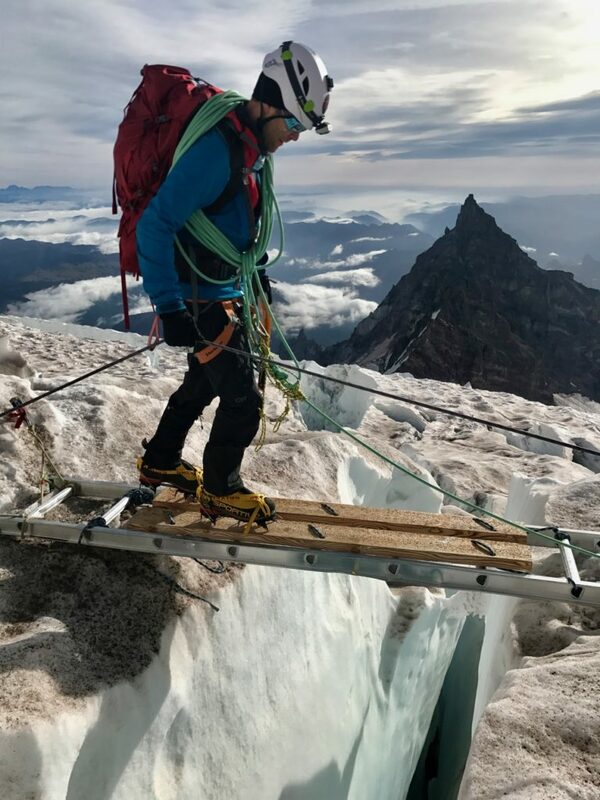 As we descended, we observed more clearly some of the hazards we had passed in the night, including a ladder spanning a 150 foot plus drop. 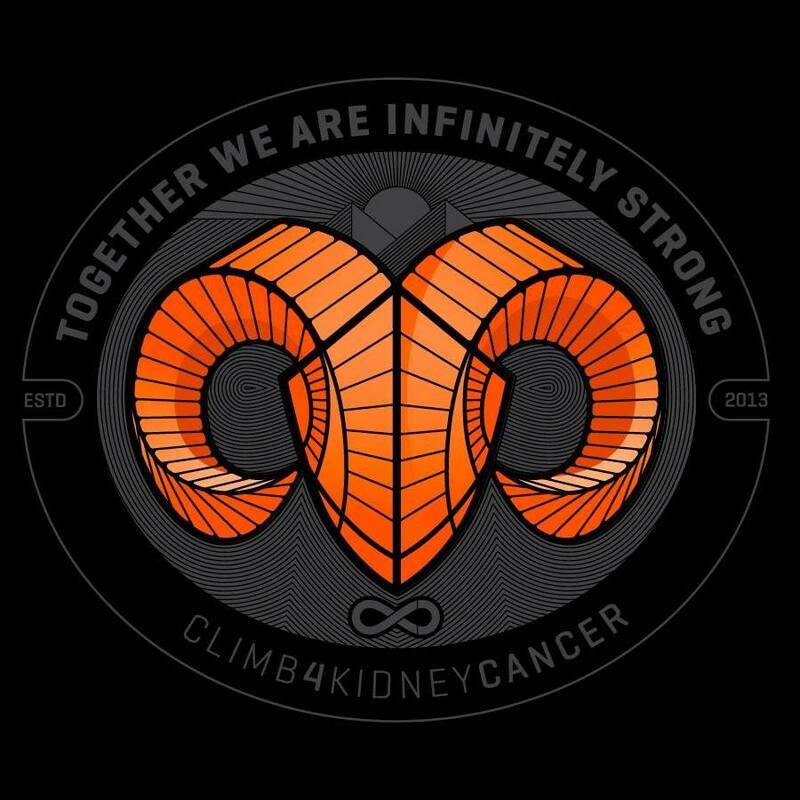 We didn’t forget those for whom we were climbing for including Donald, Wanda and Thuy who have all been affected by kidney cancer. Their stories will be available soon to read. We descended the 7000+ feet to the parking lot and ate a hearty meal. 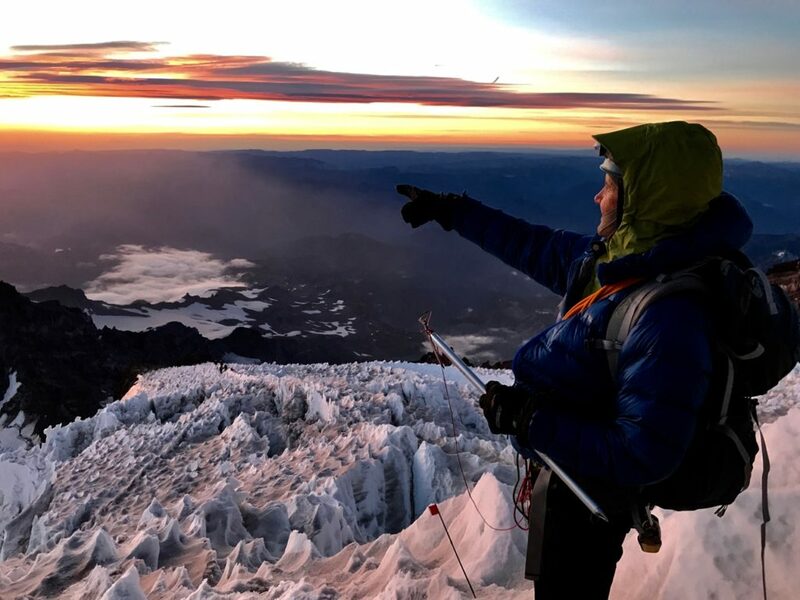 We felt bad we couldn’t make it to the summit, but we recognize that sometimes no matter how hard you prepare and struggle towards your goal, things don’t always go your way. 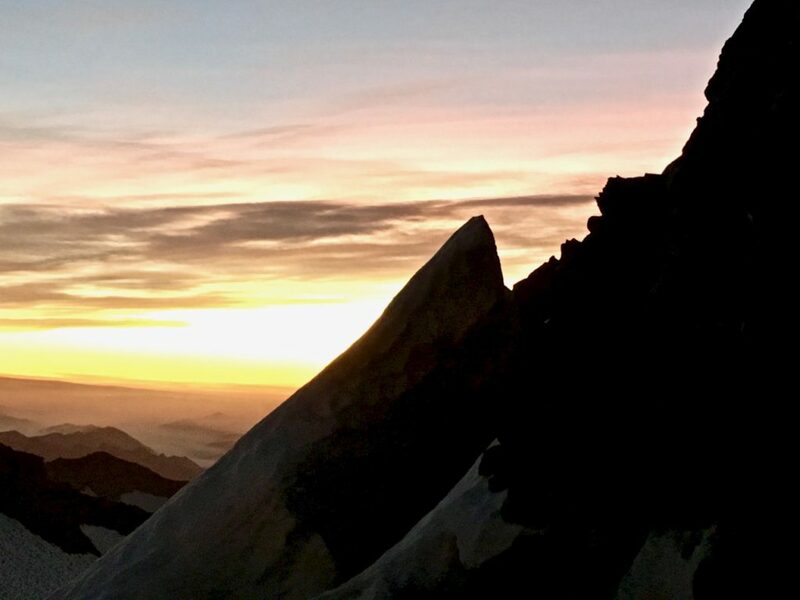 It has been said, “when you dance with the mountain, the mountain always leads.” Maybe we will come back again to try again when conditions are better.